Hope Santa has granted all your wishes!!! :) So he did for me too.. Shhhh will share the granted wish with you later. I'm celebrating this Christmas with cute little stained glass cookies :) I baked close to 100 cookies yesterday and have been sharing it with all. Sieve maida and baking powder and keep it aside. Beat the butter and sugar until fluffy. Add the egg, vanilla essence and milk to it and beat well. Finally add maida and baking powder mixture and mix well until it rolls into a soft dough. Roll the dough into a large rectangle and cut into desired shape. Make a smaller hole in the center using similar shaped cutter. Place them on a butter paper lined baking tray. Crush the candies using a rolling pin. Fill the cookie center hole with the broken pieces of candy. Preheat oven to 180°C and bake for 10-15 mins. Allow it to cool down for a while and slowly remove from the baking sheet. This quantity yields 7 to 8 dozens of cookies depending on the size. 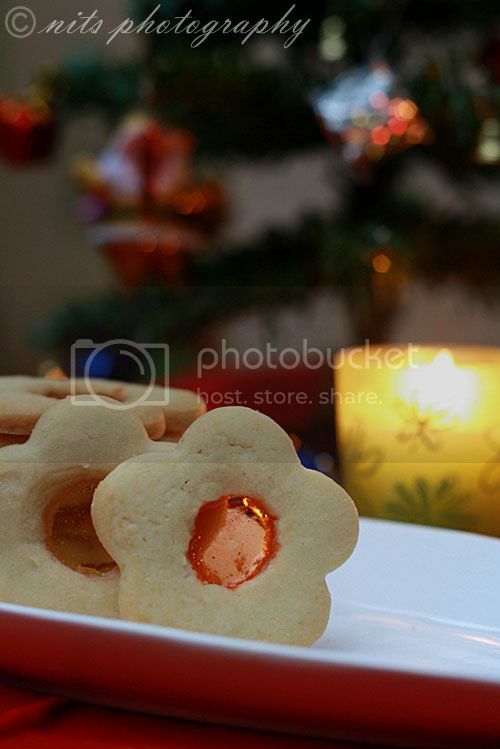 See to that the hole in the cookies is big enough to show up the glass effect. 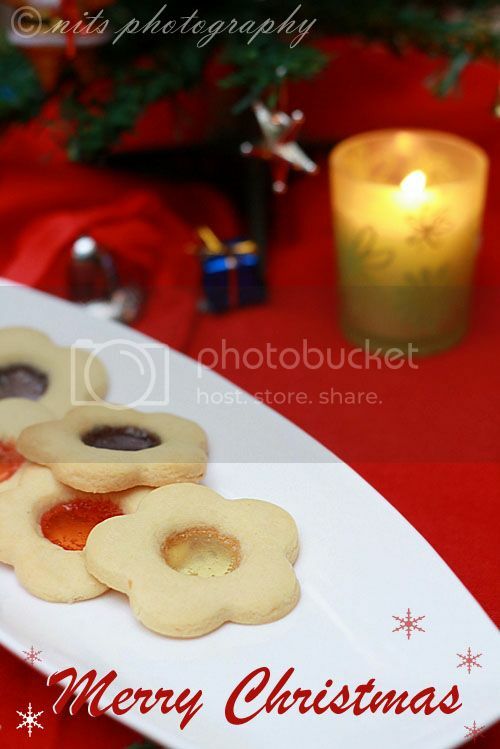 Pierce a small hole on top of the cookies before baking so that you can hang them in your tree. Wow . Must try these. Thanks. wow they look picture perfect,,, would love to try these... so do we need to put the crushed candy on the baking tray directly (inside the hole of the cookies), meaning the candy crush will touch the baking tray? Does it not stick? Amazing looking cookies Nits. Sure gonna try them out.. 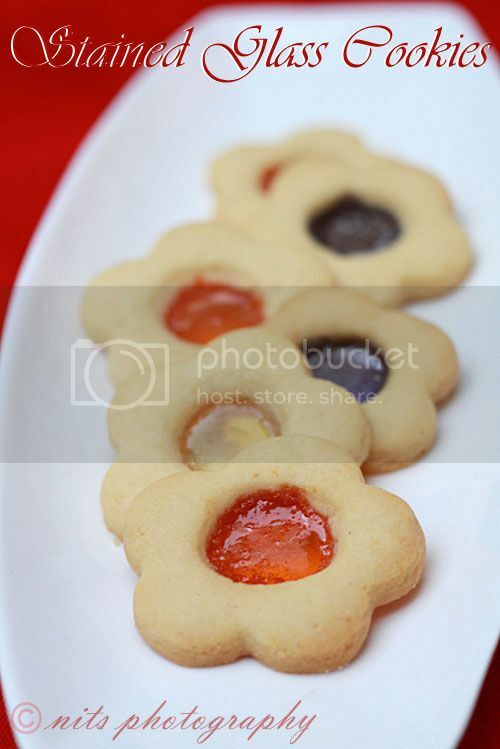 Fascinating glassed cookies, attractive and elegant. 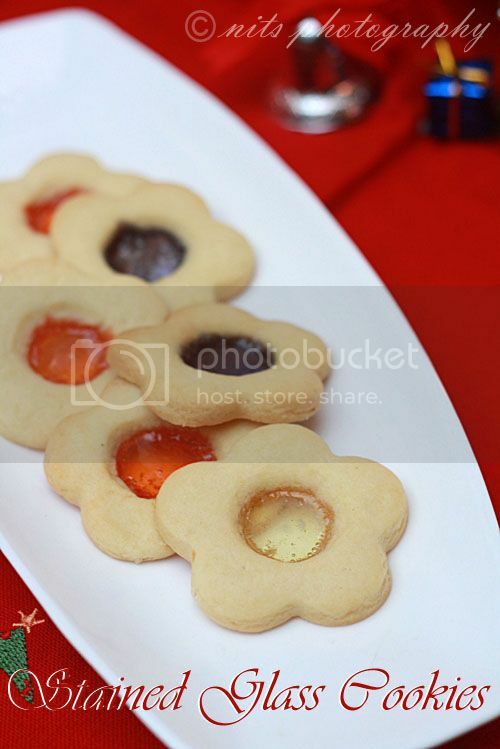 Stained Glass Cookies for your Christmas Celebration look great. Beautiful stain glass transparent effect! Lovely stained glass cookies....cute looking and am sure they tasted yum too! Cute clicks!! 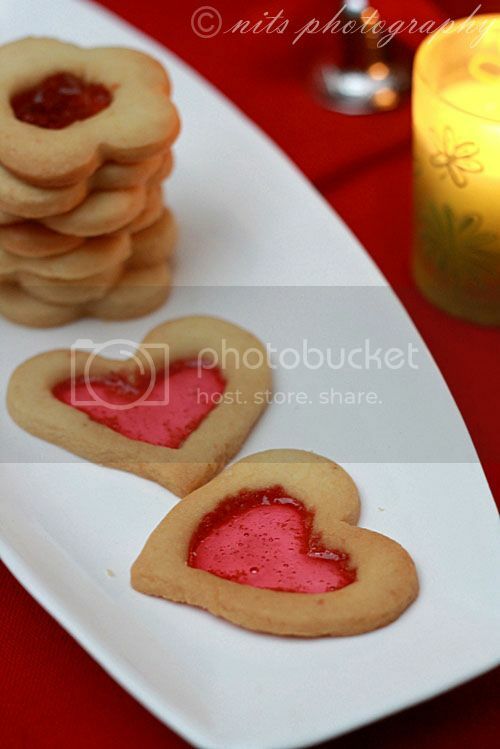 Lovely cookies...I remember doing them in my daughter`s preschool baking night for christmas two years back and we had color coded all the groups. The kids were all excited! Lovely pics! Here`s wishing you a wondeful new year! Visit My Blog For Latest Tech News All Info Updates And many More Bollywood, Lifestyle News. Did you know you can create short links with AdFly and get $$$$ for every click on your shortened urls. Get the Terrarium TV App from here and watch online movies and TV shows absolutely free. You can also share movies, videos, and shows to your friends and family members. Chocolate Cake Balls - Christmas Treats!